Perception is a funny thing; this, if nothing, I have learned in my life. It has never happened to you, to involuntary hurt someone else’s feelings, just by sending him/her one e-mail, which you thought was neutral? On the other hand, have you ever been upset by a friend’s humorous comment, that, in the author’s intentions, was meant to be no more than a joke? If this is the case, as I guess it is, you know well, what I am talking about. Different people perceive the same things in different ways. We have talked about that in an older post. Sometimes this attitude has to do with one’s culture, sometimes with his/her educations, some other times, simply, with temporary circumstances. You just can say. Therefore, there is no such a thing as an objectively perceived reality, but rather, we have to cope with many different recognized ones. Luckily, this bunch of perceived realities often overlap enough, to grant a sufficient interoperability margin. The only things that cannot be misinterpreted or disguised are objective data. The same pattern applies also to project management processes. The dichotomy, here, is about the value that project management processes ensure and the value that the project’s stakeholders perceive. Please, take a look at Figure 1. On the y-axis, there is the value that the project’s stakeholders perceive as granted by the project management processes. On the x-axis, we can find the value that the project management processes deliver. The 45 degrees line is the place where the perceived value matches the delivered one. The line is the project manager’s Shangri-La, the place where he/she will have to place. The criticism zone is the region under the 45 degrees line. In this zone, the value delivered by project management processes is greater than the perceived one. The stakeholders see the project manager’s efforts as wastes, as expenses to be cut as soon as possible and, therefore, no effective project management is possible. The project manager has to get out from this zone as quickly as possible, trying to reposition the stakeholders’ perceptions on the equity line. Such an objective is not an easy one. There are no ‘tricks of the trade’. The only possible way to reconcile the provided value with the stakeholders’ expectations, is a constant and well-crafted communication, based on sound and objective data. 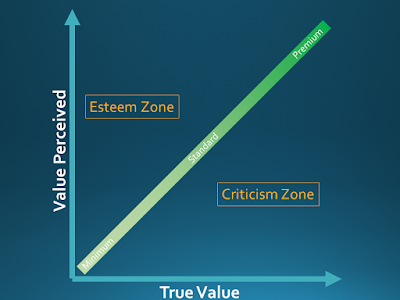 The esteem zone is the region above the 45 degrees line. In this zone, the value delivered by project management processes is less than the perceived one. The stakeholders tend to see the project manager as a kind of wizard, an almighty presence with the ability to fix almost everything. Even if the permanence in this zone is far more pleasant, than being stuck in the criticism zone, still, the project manager has the due to reposition the stakeholders’ perceptions on the equity line. Why? Well, because taking more credit than you deserve is not fair, in the first place; and because, in the long run, it is a dangerous game. My grandfather used to say, “A donkey can dress up like a horse but, sooner or later, it will bray”. If you regularly fool your stakeholders’ perceptions, what will you do when you will have to rely on those perceptions, and you will find them spoiled by your management style? Again, the only possible way out, is a constant and well-crafted communication, based on sound and objective data. As we have already suggested, the 45 degrees line is the place where the project manager should stay. Here, the perceived and the delivered value match. As we can see in Figure 1, three different zones can be identified on the line. The project management processes in place do not deliver great value, but this is crystal clear to all the stakeholders. They know what the project manager is up to, and if they feel like, they can ask for processes that are more valuable. Remember that you do not have always to be number one. Maybe, the value you are providing is good enough, for the project at hand. The minimum zone is adequate for small projects, characterized by short schedule, low budget, few people and few uncertainties. The project manager is providing a standard level of value, with the management processes in place. Everyone knows it. No one can argue that the project manager is wasting money or is underestimating the effort required. The project manager is providing great value, using complex and articulated processes. Still, everyone knows it. If the stakeholders require less effort, they will do it on a real data basis, and not just relying on perceptions. They will know that they are going to trade money with control. The premium zone is right for big projects, characterized by long schedule, very high budget, many people and many uncertainties. If you want to be considered a "project management superstar", this is the place where you want to be, not the esteem zone. Even if, sincerely, my advice is always to provide the value that is required for a good management style, without artificially raising the stake. Do not pretend to be a horse if you are a donkey and do not pretend to be a sheep if you are a lion. Play fair. Align the stakeholders’ perceptions to the value you are providing. Let the stakeholders decide if you are providing the value they expect from you, on real data basis and not on perceptions. In the long run, this will pay, no doubt about it. Maybe they will not clap their hands at you, but sure enough, they will remember you when the next project is in sight.